Cuvierina columnella, Cavoliniidae. Sargasso Sea. Sea butterflies and sea angels share having specially formed parapodia. Parapodia are lateral extensions of the foot, which those snails use like fins to swim with the open sea zooplankton. The form of the parapodia is actually quite different in both groups, as is their way of living. While sea butterflies are quite slow swimmers with large sail-shaped parapodia, living on plankton, sea angels are rather fast swimmers with small fin-like parapodia, hunting sea butterflies, among other animals. Diacria trispinosa, Cavoliniidae. Sargasso Sea. In contrary to other sea gastropods, which spend a part of their life as part of the plankton (Meroplankton), sea butterflies and sea angels are part of the plankton for their entire life, they are holoplanktontic life-forms. As such they have a large importance as part of the marine food web - the serve as food to fish as well as to whales. Cuvier in 1804 referred to both together as Pteropoda (wing foots or wing snails), a term, which could not be kept as a systematic term, but which points to the shared characters of both free swimming groups. New molecular biological research results appear to indicate that the term might, however, have some justification. Klussmann-Kolb, A.; Dinapoli, A. (2006): "Systematic position of the pelagic Thecosomata and Gymnosomata within Opisthobranchia (Mollusca, Gastropoda) - revival of the Pteropoda". Journal of Zoological Systematics and Evolutionary Research 44: 118. The sea butterflies with the systematic name Thecosomata (Greek: shell body) do have reduced their shell, like most opisthobranchs, for the benefit of a better movability, but most of them still have a shell, thin and translucent, but still made from calcium carbonate. This makes them quite vulnerable to the increasing acidification of the sea water, as their lime shell is harmed. It is assumed that sea butterflies, very small creatures with a shell measuring about a centimetre in size, may be extinct in some parts of the earth by 2050. Sea butterflies catch their prey with the help of a mucus net about 5 centimetres in size, which they can discard when in danger. Like a nautilus, they migrate up and down in the water column following their prey; while they are found in the deep during the day, they appear near the surface during the night. Clione limacina, Clionidae. Arctic Sea. Sea angels and sea butterflies in the Arctic Sea. National Geographic Movie on (Youtube.com). Geologically, sea butterflies probably are a very young group, as they appear but in the late Palaeocene (about 57 mill. years ago). There is, though, the problem of the fragile shells surviving petrifaction only with difficulty. Ecologically, they have an important place at the food chain's base, as they serve as food to many species, including sea angels, to which they are almost the only food source. In contrary to sea butterflies, sea angels' shells have been completely reduced, which gave them the scientific name of Gymnosomata (Greek: naked body). As many species almost entirely live on sea butterflies, they have evolved along the same paths: Size and behaviour are adapted to that of their prey. So the largest species of sea-angel, Clione limacina, grows to only 5 cm size. 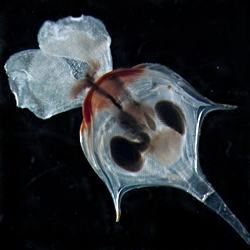 The species in six families of sea-angels distributed in warmer waters, are much smaller. With their small fin-like parapodia, the perform a rowing motion, which is why they are also called rowing snails (at least in German). In periods of rest, sea angels beat their parapodia about twice a minute and move quite slowly. When hunting, they can speed up noticeably. The hunting behaviour in sea angels is different - there are lurkers and species chasing their prey. 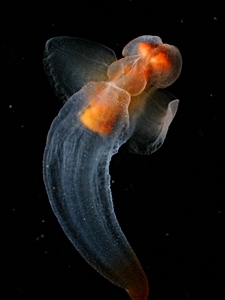 Some sea angel species have additional tentacles, some even with suckers, to grab their prey, while eating it. 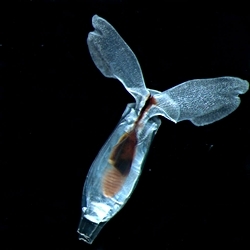 To be protected against predators themselves, the Antarctic sea angel Clione antarctica produces a deterrent, an only recently discovered compound called Pteroenone. Amphipods (Hyperiella dilatata) use this by catching a sea angel from their large number and carrying it around to be protected from predators themselves. Antarctic sea angels in some places appear in densities of up to 300 individuals per cubic metre of sea water. Neuweiler, G.; Heldmaier, G.: "Vergleichende Tierphysiologie", Springer-Verlag 2003; p. 132. Bill Rudman: Clione antarctica on seaslugforum.net. Like other shell-less opisthobranchs, sea angels only are shell-less after metamorphosis: The larva hatches with a shell and discards it some days later.